Five outstanding GCC postdocs and Ph.D. student were awarded for their groundbreaking research, and for inspiring future generations. Dubai, United Arab Emirates. 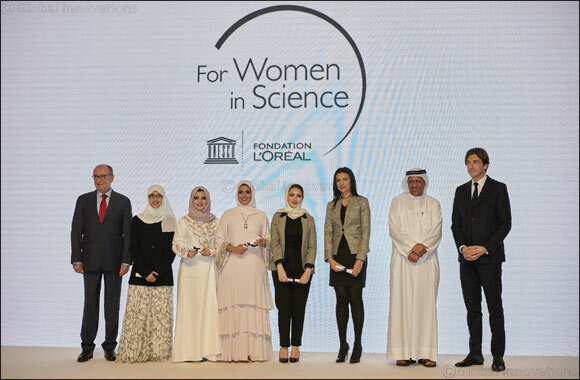 November 27th, 2018: The fifth edition of the L’Oréal-UNESCO For Women in Science Middle East Fellowship Awards ceremony was held yesterday to recognize five extraordinary GCC women for their contribution to the field of science. The awards ceremony was hosted at the Hilton Dubai Al Habtoor City Hotel, in partnership with Zayed University. This year’s awards celebrated the contributions of distinguished female scientists and researchers in the GCC, whose works have contributed significantly to the scientific development in the region. The inspiring women fellows were each awarded EUR 20,000 for the Postdoc Researchers category and EUR 8,000 for the PhD Students category, in recognition of their outstanding achievements in their respective fields of study. The L’Oréal-UNESCO For Women in Science Middle East program was founded on the belief that ‘the world needs science and science needs women, because women in science have the power to change the world.’ Not only were the female fellows recognized for their achievements; they were also highly commended for their advocacy of the field of research and for influencing young women to tread similar paths. The L’Oréal Foundation for Women in Science Program was launched in the GCC region in collaboration with Zayed University and is intended to change the way young women feel about a scientific and research-based career, in hopes of shattering stereotypes of it being male-dominated. In line with this initiative, both L’Oréal’s and Zayed University’s core values are deeply rooted in empowering women to explore fields that they can truly excel in and will ultimately benefit the world around them. With UNESCO, the Foundation has honored almost 100 laureates for their research achievements – three of whom, have gone on to win a Nobel Prize., such as Elizabeth H. Blackburn and Christiane Nüsslein-Volhard. · Dr. Basma Radwan (United Arab Emirates), New York University in Abu Dhabi: For her research in examining the connection between sleep and stress to further identify enhanced and effective therapeutic solutions targeting depression and mood disorders. · Dr. Ashwag Albukhari (Saudi Arabia), King Abdulaziz University: For her research in developing pre-clinical models to investigate the mechanism(s) of developing ovarian cancer. This will aid in the early detection of ovarian cancer with a substantial impact on improving patient survival. · Dr. Lamya Al Haj (Oman), Sultan Qaboos University: For her two-streamed research on exploring second, third and fourth generation biofuels as clean and sustainable energy resources and investigating the potential of utilizing algae strains for the production of high-value products. · Dr. Saja Fakhraldeen (Kuwait), Kuwait Institute for Scientific Research: For her research on identifying local sources of biologically active materials to reduce dependency on foreign imports and incorporating genetic analysis to existing bioprospecting efforts to maintain a delicate balance between minimizing environmental disturbance while maximizing derived benefits. · Ghofran Othoum (Saudi Arabia), King Abdullah University of Science and Technology: For her research in establishing the ability of Red Sea species as microbial cell factories that thrive in their natural environment without the need for complex processes of water desalination and sterilization. The L’Oréal Foundation helps women fight prejudice, tear down gender barriers, and conquer new areas in science. Nearly 2,998 women in over 115 countries have been the recipients of Fellowship. Since 1998, the L’Oréal-UNESCO For Women in Science program has honored 102 Laureates for groundbreaking discoveries or seminal contributions to their field of research.